Content and Language Integrated Learning (CLIL), which had its origins in Europe in the 1990s, has been developed on the assumption that language learning is more effective if knowledge of content other than language is simultaneously acquired. Nowadays, however, CLIL tends to be considered more as one form of English-medium instruction, which symbolizes the current trend towards globalization in education. In Japan, where it is still in its early stages of development, CLIL-related practices are rarely documented and its potential effectiveness as a pedagogical approach is yet to be determined. This chapter situates CLIL within the context of Japan’s higher education, with a particular focus on the Top Global University Project. While the government pushes the higher education sector to increase its international competitiveness by improving English proficiency levels and increasing the number of international students, there is an absence in government policies of acknowledgment of EMI and of the notion of bilingual education. This chapter examines how top Japanese universities have engaged in CLIL, analyses relevant documents published by universities and government offices, and identifies the problems and challenges in implementing CLIL or CLIL-influenced programs in Japan. Agency of Cultural Affairs (ACA). (2014). 平成25年度「国語に関する世論調査」 の概要 [2013 Fiscal year opinion survey on the national language overview]. Retrieved from www.bunka.go.jp/tokei_hakusho_shuppan/tokeichosa/kokugo_yoronchosa/pdf/h25_chosa_kekka.pdf. Aoki, M. (2017, April 6). Japan’s latest English-proficiency scores disappoint. The Japan Times. Retrieved from www.japantimes.co.jp/news/2017/04/06/national/japans-latest-english-proficiency-scores-disappoint/#.WiT7YtOCxPY. EF. (2017). EF English proficiency index. Retrieved from www.ef-australia.com.au/epi/. Ikeda, M., Pinner, R. S., Mehisto, P., & Marsh, D. (2013). Editorial. International CLIL Research Journal, 2(1), 1–2. http://www.icrj.eu/21/editorial.html. Japan CLIL Pedagogy Association. (2018). The 1st J-CLIL Annual Bilingual Conference. https://docs.wixstatic.com/ugd/d705d2_4a89217c8f9f4c459443ebcde15a2520.pdf. Japan Society for the Promotion of Science. (2018). スーパーグローバル大学創成支援事 業 中間評価結果の総括 [Top Global University Project interim assessment summary]. Retrieved from https://www.jsps.go.jp/jsgu/chukan_hyoka_kekka.html. Japan Student Services Organisation. (2017). 平成29年度外国人留学生在籍状況調査結果 [2017 Fiscal year, survey results on foreign students enrolment]. Retrieved from https://www.jasso.go.jp/about/statistics/intl_student_e/2017/index.html. Lo, Y. Y. (2017). Development of the beliefs and language awareness of content subject teachers in CLIL: Does professional development help? International Journal of Bilingual Education and Bilingualism. Advance online publication. https://doi.org/10.1080/13670050.2017.1318821. MEXT. (2010). 外国語能力の向上に関する検討会(第一回)議事要旨 [Study panel for improvement of foreign language proficiency (the first meeting): Summary proceedings]. Retrieved from http://www.mext.go.jp/b_menu/shingi/chousa/shotou/082/gijigaiyou/1301500.htm. MEXT. (2012). 2012 White paper on education, culture, sports, science and technology. Retrieved from http://www.mext.go.jp/b_menu/hakusho/html/hpab201201/detail/1344908.htm. MEXT. (2013). 2013 White paper on education, culture, sports, science and technology. Retrieved from http://www.mext.go.jp/b_menu/hakusho/html/hpab201301/detail/1360701.htm. MEXT. (2014a). 外国語教育における「CAN-DOリスト」の形での学習到達目標設定に関 する検討会議(第9回)主な意見 [Study panel for achievement target setting by using “can-do list” for foreign language education (the ninth meeting): Major comments]. Retrieved from http://www.mext.go.jp/b_menu/shingi/chousa/shotou/092/shiryo/attach/1344701.htm. MEXT. (2014b). 平成26年度「スーパー・プロフェッショナル・ハイスクール」 (SPH)指定校 について [2014 “Super Professional High School” (SPH) designated schools]. Retrieved from http://www.mext.go.jp/b_menu/h2014oudou/26/04/1346420.htm. MEXT. (2014c). Press release ‘Selection for the FY2014 top global university project’. Retrieved from www.mext.go.jp/b_menu/houdou/26/09/__icsFiles/afieldfile/2014/10/07/1352218_02.pdf. MEXT. (2015). Open image in new window [Post-project evaluation report on the Global 30 Program]. Retrieved from http://www.mext.go.jp/a_menu/koutou/kaikaku/1355917.htm. MEXT. (2017a). スーパーグローバルハイスクール(平成27年度指定)の中間評価に ついて [Super Global High Schools (designated in 2015) interim assessment]. Retrieved from http://www.mext.go.jp/b_menu/houdou/29/09/1396726.htm. MEXT. (2017b). 広島大学附属小学校 [Hiroshima University attached primary school]. Retrieved from http://www.mext.go.jp/a_menu/shotou/kenkyu/htm/08_news/1401003.htm. MEXT. (2018a). 「スーパーグローバル大学創成支援事業」(平成26年度採択)の中間評価 について [Top Global University Project (2014 selection) interim assessment]. Retrieved from http://www.mext.go.jp/a_menu/koutou/kaikaku/sekaitenkai/1401770.htm. MEXT. (2018b). スーパーグローバル大学創成支援事業グッドプラクティス集 [Top Global University Project Good Practice Collection]. Retrieved from https://tgu.mext.go.jp/downloads/index.html. Nikkei. (2017, September 5). 東大、過去最低46位に　英紙の世界大学ランキング [Tokyo University record-low 46th. English journal world university ranking]. Retrieved from https://www.nikkei.com/article/DGXLASDG05H8I_V00C17A9000000/. Nikkei. (2018, 26 March). Open image in new window [Seven English commercial tests were approved for the centre test: Problems in fairness]. Retrieved from https://www.nikkei.com/article/DGXMZO28577840W8A320C1CR8000/. Sasajima, S. (2013). How CLIL can impact on EFL teachers’ mindsets about teaching and learning: An exploratory study on teacher cognition. 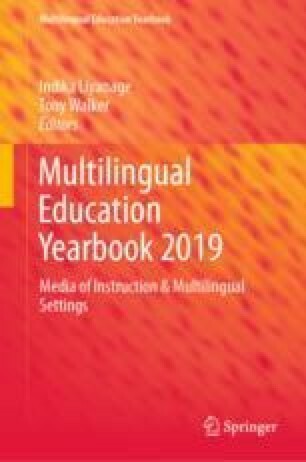 International CLIL Research Journal, 2(1), 55–66. http://www.icrj.eu/21/article5.html. Super Global High School. (2018). Outline of Super Global High School Program. Retrieved from http://www.sghc.jp/en/. Yokosuka-City. (2017). 平成29年度「公立学校における帰国・ 外国人児童生徒に対するきめ細かな支援事業」に係る報告書の概要(横須賀市)[Summary of a report on “Support projects for returnee and foreign children at public schools”]. Retrieved from http://www.mext.go.jp/a_menu/shotou/clarinet/003/001/1405579.htm.